There has been a lot of action lately on the various scandals du jour involving the Obama administration. The latest shoe to drop shows what I expected from the administration targeting AP correspondents: that the administration did not limit itself just to the AP, but have been targeting Fox News as well. I wouldn't be surprised if the target list expands still further. 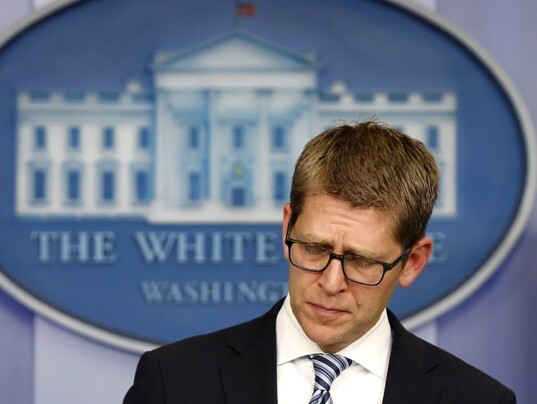 Jay Carney at press briefing. The sign says it all. 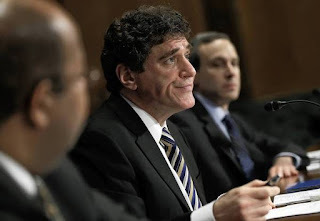 The IRS case involves high-level agency managers (again, you know that it couldn't have been a couple of low-level flunkies) targeting conservative groups yet showing favoritism toward liberal ones. (Look for the name of Cindy Thomas to start showing up as we climb the chain of command.) You likely will not be surprised (I wasn't) to learn that veterans are in their cross-hairs too. A very illustrative example, which hasn't yet received the publicity that one would expect, involves the Barack H Obama Foundation (name ring a bell?). This 'foundation' drew the suspicion of the National Legal and Policy Center, which first noticed that it was "promoting itself as a charity and seeking donations that it said would be tax-deductable, but it lacked the required tax-exempt status." Once caught, the foundation quickly applied for the status and was approved within 34 days, far shorter that the average five or six months, and certainly shorter than the many months – or years – of investigations for conservative organizations, asking (as one example) for lists of donors, transcripts of speeches, copies of all newsletters, and how they prayed, among the 55 exhaustive questions required of them. Not only did the foundation, named after the father of the President, receive an unusually rapid turn-around, its new status was backdated to December 2009, which covers the time period of the complaint of the NLPC, despite the fact that the foundation never requested it. 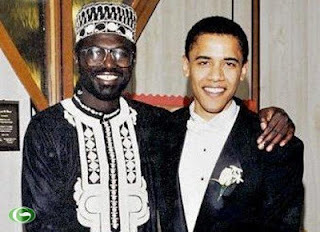 The purported foundation has Abon'go Malik Obama as its director. Abon'go is a half-brother to Barack Obama by the senior Obama's first wife. Barack's interlocutors have remained mum on the embarrassing connection, and apparently hope that it receives as little attention as the news concerning the President's aunt Zeituni and (separate) uncle Onyango, both of whom reside in the US illegally and have remained fraudulently, though both cases are now "under review". Charles Dickens said "It is a melancholy truth that even great men have their poor relations", and the administration's actions (or lack thereof) give the impression that these are simply distant relations with whom the President has lost touch long ago. In the case of Abon'go, though, the two of them were close enough that Abon'go served as best man at the marriage of Barack and Michelle. For that matter, Barack served in the same capacity for Abon'go, though it is not clear which of the twelve wives of Abon'go this applies to. The foundation states that it has built a madrassa in Kenya (though that has recently been deleted from its internet site) but otherwise uses airy phrases about improving the "food, water, and shelter" in order to "elevate the human condition" and "dignity" in his local area. No specifics are given. This so-called charity lists two addresses, one of which turns out to be a post office box at a UPS location in Alexandria, Virginia. The physical address in the IRS filing is occupied by a drug and alcohol recovery service, and has been for "a couple of years" according to its receptionist, which extends back to the date listed on the IRS filing of May 2011. Nobody at that recovery service has ever heard of the Barack H Obama Foundation. This is just one of the elements of the IRS investigation into its abuse of conservative groups, including handing over tax documents on the groups to "liberal news organizations". Lois Lerner, the IRS official who rapidly signed off on the foundation's application and who is neither "good at math" nor answering questions from the press, is under increasingly scalding water of her own, so much so that the Washington Post Fact Checker stamped her with the Four Pinocchio grade of untruthfulness, though its headline says that she deserves a "bushel" of them. Taking her cue, Lerner has now invoked the Fifth Amendment against self-incrimination for her scheduled testimony before Congress. This should prove to be about as productive as the testimony of the two previous IRS commissioners. Have we finally arrived at the time where even the MSM is past the tipping point and actually begins to criticize Obama? Diehards are still demanding that this series of offenses not be compared to Watergate, but that crisis took some time to get going too. The IRS was aware of the abuse at the top levels by May 2012. Just six months before the election. America learned during testimony in Congress today that not only was the IRS aware of the abuse, it had investigated it. Having investigated it, the agency then covered it up and told Congress nothing about it. The IRS maintained the charade just long enough for Barack Obama to be re-elected. Now, the IRS orchestrated breaking the scandal open more than a year before the next mid-term, an election in which Barack Obama hoped to flip the House to Democrat control and consolidate his power for the remaining two years of his presidency. Lerner, fortunately, will be back and hopefully will be grilled. She f-upped when she made her little speech about her innocence before she tried to invoke the fiver. Another hack caught in the crossfire. Serves her right. Her cafeteria-style approach to the 5th Amendment (I'll talk about this, but I won't answer that) has been out of the norm for decades. And she's a lawyer. One would think that she (and her lawyer too for that matter) would know better. This is the caliber of people that we have in positions of trust and responsibility, pulling in megabucks in salary and perks. Nothing more than political hacks. And she got her start at the Federal Elections Commission -- imagine that. She knows who she works for, the most disgraceful president in a generation.